Walnuts: Do You Have Protection? Just 8 walnuts can help protect the arteries from the damage of a high-fat meal, according to intriguing research published in the Oct. 17, 2006 Journal of the American College of Cardiology. A high-fat meal brings immediate consequences, temporarily stiffening the arteries, and rendering them incapable of responding normally to exercise. Over time, the damage accumulates, leading to permanent hardening of the arteries – something we are now seeing in teens. Volunteers in this new study all ate a salami and cheese sandwich on white bread, with full-fat yogurt. Half of them also got 8 walnuts with the meal; the other half got some olive oil. A week later, this was repeated, but each person got the other option. Sophisticated testing showed significantly less blood vessel damage when the volunteers got their walnuts. 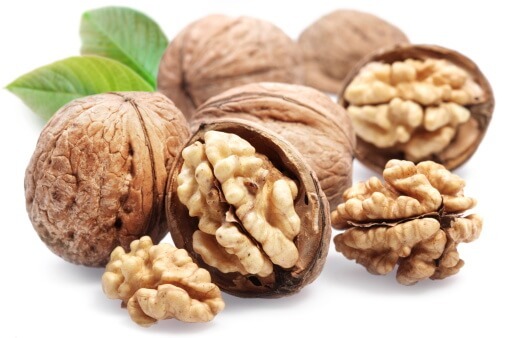 Walnuts are rich in certain highly unsaturated omega-3 fats, which appear to act like a shield for the artery walls. Nuts: an anti-junk food. So, to, are beans, fruits, vegetables, and whole grains. Delicious healthy foods can help build, protect, and repair healthy bodies.